At what point do the numbers get so large that they become meaningless? We may have hit that point. The federal deficit climbed higher into record territory in July, hitting $1.27 trillion with two months remaining in the budget year. The Treasury Department said Wednesday that the July deficit totaled $180.7 billion, slightly more than the $177.5 billion economists had expected. The Obama administration is projecting that when the current budget year ends on Sept. 30, the imbalance will total $1.84 trillion, more than four times last year's record-high. The July deficit reflected government spending of $332.2 billion, a record amount for any month and up from outlays of $263.3 billion in July 2008. Government receipts totaled $151.5 billion, down 5.6 percent from a year ago. It marked the 15th consecutive month that government receipts have been lower than the same month in the prior year, illustrating how deep the recession has cut into tax receipts. Through the first 10 months of the budget year, receipts total $1.74 trillion, down 16.9 percent from the same period in 2008. Outlays totaled $3 trillion over the past 10 months. The deficit for all of last year was $454.8 Billion, a record at the time. The thing to take away from this is: receipts are $1.74 Trillion. Outlays are $3 Trillion. That is a condition that can't continue for long. government spending at a record. Question is what kind of government spending and for each buck what's the bang? Then, the deficit, these numbers, the use of "trillions" has become so mind numbing, it's like it is all ignored as you point out. What is the tipping point (as one who does believe Keynesian works when the economy is not a full capacity)? I'm just aware that there are forces out there pushing Gold based on "impending economic Armageddon implosion" fears. I'm back to writing, commentary off on all things shiny. economic circumstances dictated some form of economic stimulus (I thought we could have done better). The important issue is whether, if we do start to truly recover, there will be serious deficit reduction policies implemented. But to have a true recovery, and not one masked by increased leverage, we must change our economic growth model. The faster the rate of growth the more quickly it gets paid off and the less goes to servicing interest. And the more likely we are to crash and burn again sooner rather than later. Even better, there are some things that will clearly help (not spending so much on the military, closing tax loopholes, more progressive tax rate, investing in technology, infrastructure and people instead of investing in debt) but those are just as clearly out of bounds for discussion. This is a pet peeve of mine. The government, as we all know full well, has invented all kinds of interesting and dubious means (that are not permitted in the business world)to hide the full measure of its failures. The budget deficit as reported is a sham. It removes a large number of outlays (but no receipts) that are "off-budget". 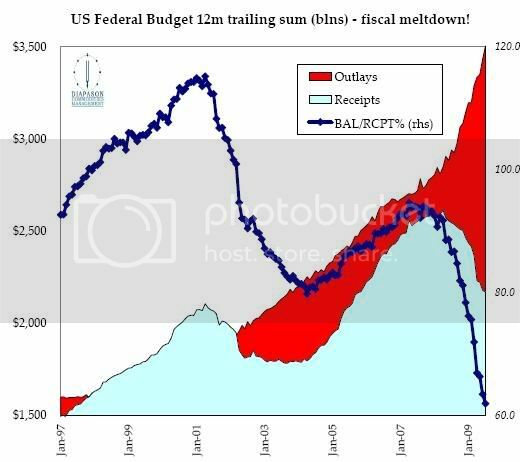 The real deficit is the actual difference between outlays and receipts. For the 2008 fiscal year that number was 760 billion not including intra-governmental debt (e.g. social security) and 1.02 trillion if you include the latter. As of August 11, the corresponding numbers for this year are 1.52 trillion and 1.64 trillion. That ain't chump change. It doesn't change the point of the post, but the bottom line is that it's worse than you think. But hey, what's a couple of hundred billion dollars here or there? that would make one paranoia inducing fantastic blog post to detail this out with graphs, stats. But it will take a while. I need to finish another piece I'm working on for an entire other set of cooked books...and try to keep my business afloat in this ungodly mess.